Did you know that wrong food combinations can cause severe gastric issues? Since childhood my mom taught me what combinations I should not take together. She never allowed us to have milk and fruits together, daal and curd together, and for a lot of people it is no fish and milk products together. I always wondered why. Did you as well? For my family it was always religious ritual and for others it might just be a rule, but I always wanted to find the reason behind it. This curiosity made me search and write on the science behind food combination. So yes this belief does have scientific reasoning and to my surprise AYURVEDA supports this. So before moving to the combinations let us understand what happens to food after we ingest it. According to AYURVEDA, every food has its own taste known as “rasa”, a heating or cooling energy called “virya” and a post digestive effect “vipaka” , some will also posses “prabhava” an unexplained effect. Our gastric fire or “AGNI” largely determines how well or poorly food is digested. The AGNI can get overloaded if 2 or more different ingredient having different taste and energy are combined. This overload can inhibit the enzyme system and lead to production of innumerable toxins in the body. Different food groups have different digestion time, and when we combine foods which have roughly the same digestion time, the process becomes easier. If the food that goes inside the stomach is not digested properly it can cause indigestion, fermentation, putrefaction (process where the consumed food rotten) and gas formation and if prolonged it can lead to toxemia and diseases. 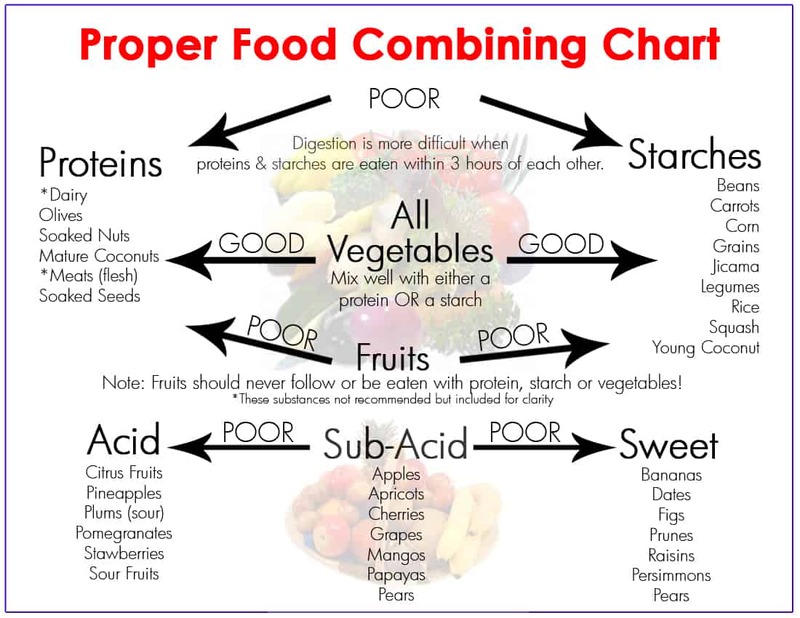 On the other side correct food combinations will aid digestion, utilization and right absorption of nutrients. Each food will require a different environment to aid the digestion process some will require an acid environment and for some it will be alkaline. So I’m sure the chemistry students know this – Acids and Alkali neutralize each other, which in turn hampers the digestion process. Proteins will require an acidic environment to digest whereas the starches, sugars or fruits will require an alkaline environment, so when such combinations are combined the digestion can be hampered. Too much of theory isn’t it? So let’s jump to some combinations through which you can link the above theory and understand things in a better way. Milk is best when taken alone as it’s a concentrated food by itself. Milk does not allow the food to mix with saliva, which makes digestion difficult. Milk constitutes of both fats and proteins which after reaching the intestine coagulates to form curd. Further this curd does not allow gastric juices (which help in digestion process) to act upon the food, because it surrounds the starches that are eaten along with milk. The starches are digested only after the milk curd is digested. Also milk is digested in the duodenum whereas most of the other food is digested in the stomach; therefore foods combined with it remain undigested. For eg – Milk with citrus fruits, bananas, melons. This means that different kind of proteins from the same category can be taken together, but not the totally different ones. For e.g. – Almonds and walnuts can be taken together, but not fish and curd. Proteins from different groups have different time and type for release of digestive secretions. For instance – if we consider milk, strongest juices are released when milk is consumed in the last hours of digestion. Same way eggs receive strongest secretions at different time compared to that with flesh or milk. Therefore it becomes very difficult for the body to meet the requirement of 2 proteins at the same meal. In the presence of sour or acidic foods in the stomach, gastric juices may not be released. This combination when taken together may badly affect protein digestion and cause putrefaction (process of rotting). Curd is also acidic in nature therefore should be avoided with daals. Acidic fruits slow down the quick digestion of sugars present in sweet fruits which leads to fermentation. Heated or fried foods or fat insulated foods remain in the stomach for a long time and cause a lot of strain. Therefore putting too much fat on daal or frying daal will be digested slowly. Same rationales apply for milk and milk products they do not digest quickly in comparison with other proteins as they already have good amount of fats. Melons are most quickly digested than any other foods and may cause fermentation, if combined with other foods. Therefore they are best when eaten alone. Large quantity of liquid should be avoided with solid foods the reason is that liquids pass through the intestine very fast. If they are held for a long time due to combination of solid foods they may cause fermentation. May also wash away the digestive enzymes and hinder digestion. Therefore any liquids should not be taken immediately before or after a meal. Taken 1 hour post the meal will be beneficial. I know I have put in too many wrong combinations, but I have some good news too. There are some foods and factors that can lower the effect of such combinations. If our body is accustomed to a certain food combination through many years of use then it is likely that our body has got accustomed to this. For instance – A lot of us have daal and curd combinations for eg kadhi , dahiwada , khichdi with curd and it would not cause digestive issues for most this is because the body is accustomed to that combination since years , but we even got to understand that its not the best that your body can digest. Eating a bad combination occasionally will not affect the digestion too much, the only thing that should be kept in mind is that it should not happen too frequently. Pure cow’s Ghee stimulates AGNI and improves digestion. Small sips of water during a meal will aid digestion and absorption of foods. Do not have large amount of water though. Do not drink iced water as it slows AGNI and digestion. Proper chewing is essential to good digestion ensuring food gets thoroughly mixed with saliva. This is will aid digestion process. A cup of buttermilk at the end of a meal also aids the digestive process as it is rich in gut friendly microbes. Ideally one should fill the stomach with 1/3 food, 1/3 liquid, 1/3 should be empty therefore never over eat. Eating foods rich in vitamin C can improve iron absorption. Suggested Read, 10 Foods so rich in Vitamin C, you’ll never need a supplement again!! Calcium absorption can be improved by loading you body with good amount of vitamin D.
Vitamin D will improve the absorption of these minerals from the digestive tract and inhibit calcium excretion from urine. Sources of vitamin d are exposure to sun , fatty fish , eggs. Sources include – broccoli, Brussels sprouts, chick peas, kale, eggs and dairy. Some among these are high on antioxidant power. Medium chain fatty acids are even better as they are smaller than the fatty acids found in most other oils and therefore enter the cell membrane easily. Probiotics mainly curd which comes naturally helps to improve gut friendly bacteria which in turn help in better nutrient absorption. Have no qualms about having a cup of curd every day! So that was my two cents about Viruddha Aahar. Hope you can use this information to better your health. Tumran, A. C. (2014). Review on Therapeutic Significance of Viruddh Aahar. International Journal of Research in Ayurveda and Pharmacy, 5(4), 571-574. Talekar, M. (2015). Role of Viruddha Aahar in Kushta (Skin Disease): An Epidemiological Study. International Journal of Research in Ayurveda and Pharmacy, 6(3), 335-341.